The boy was returning home from the field when suddenly the azure sky started changing its colour. Within a few minutes, the azuline changed to aubergine and, then, atrous. The trees stopped nodding their heads in the wind; the chattering of the birds ceased as if Nature was setting the stage for its final presentation. The eerie silence of the surrounding….. the untimely evening as it was quickly covering the earth, informed him of the imminent catastrophe. The brave, little kid raised his small fists up to the sky and shouted,”I’m not afraid, I’ll reach home safely…” he paused and muttered, “alone”. His father and some other people were looking for him. They were shouting, but little could be heard over the deafening thunder. The lightning struck again and, one of them found the boy; sitting under a tree, face buried in his knees. It started raining and, no one noticed his tears. I’ve been tagged by Vishal to take part in the Five Photos Five Stories (FPFS). The challenge works like that: You post a picture for five consecutive days and attach a post to it, fiction, poem or short write-up. It can be anything that suits your taste. I am also tagging my good friend, Anoop on Day Three, as part of the challenge, I will tag a new person on Day Four. The description of the night stole my heart….rest was icing on the cake 🙂 superb!! …and what a terrific capture to go with it! Aww the poor little boy! I love when the sky looks like that!!! In fact, the recent short story on my blog (The Grey Building…) was written on a day when the sky looked pretty much like in your pic. Liked reading the story Maniparna. 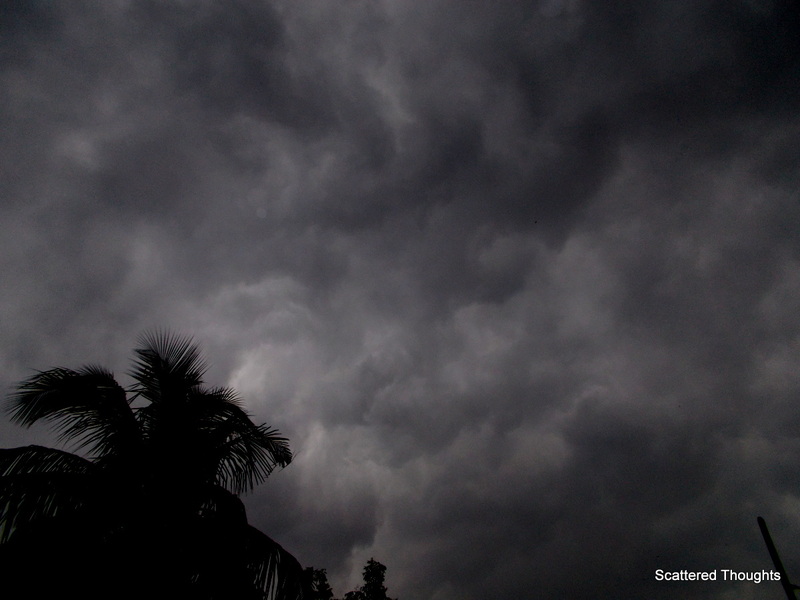 The lil boy was surely brave to face the dark sky and the thundering clouds. Might have been a great tension for the Little Boy for a while…. But Mother Nature is equally kind…. With all Love, She nicely taught him something else too…. The little boy was certainly a brave one ! The words goes so well with the image ..specially where you changed the colours of the sky ..